At the annual picnic 2000, I had the information that this dairy was founded by Mr. Bob Graham in early 1900's. It was situated in Alexandria Ontario then the dairy has been sold to his son in law "Doug Baxter". Doug kept it till it's acquisition by "Lowe Dairy" in 1946. 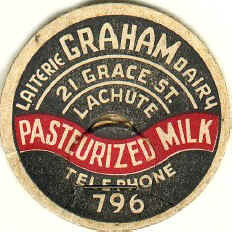 An other information stated that this dairy first opened in Quebec just a few kilometers from Lachute and than opened a branch in Alexandria. Source : Mr. Duncan MacArthur from Landcaster Ont. Source 2: M. Jacques Fauvelle from Gatineau Que.